It's here! Yay, finally! I mean, no offense to Home Depot, but the shipping took forever. Maybe it's because I just really wanted it...bad. Remember the nasty light in my staircase? If not, check it out. Anyway, I decided on this lantern from Home Depot, it is available elsewhere but HD had it for the cheapest with free, albeit slow, shipping. I'm impatient did you hear? I still haven't decided, higher, lower, remove the window treatment? (I bought that on sale when we moved in but don't really have a love for it, but do need the privacy at night. Ya know, the jammies in the stairs situation) How come every time I do a "little project" around here it leads to another "little project?" I need some advice, so please comment!!! I love your new light fixture. It is great size foi the space. It Is so hard to hang things in a stairwell where it will be seen from different angles. I would figure out where you will see it most often and hang it as if it was on a single story. From your pics I would hang it higher and let the window be the focal point and I would keep the window covering. Thanks Traci! I will take your advice! I love it! I wish I had a foyer like that to put one in, too! I ended up getting a light fixture from Home Depot years ago......can't beat the price and it's still a favorite......your fixture looks great with the railing color and keeps the contemporary feel of the stair case improvements. What are you going to do for the other fixtures that need replacing? 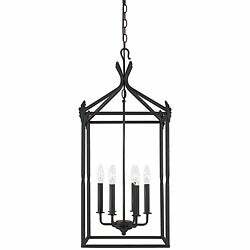 I'm still trying to find one that goes with my light fixture in my entry way as well. Thanks for the comments, I have not done a thing with those other lights! I can't find anything affordable enough, since I need 3 for the hallway upstairs!! Any ideas? Let me know!